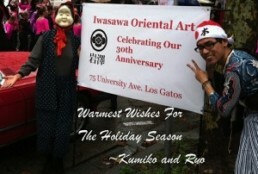 Iwasawa Oriental Art continued its 30th anniversary celebrating by participating in the 2012 Los Gatos Christmas Parade on Saturday, December 1st, 11 AM- 1 PM. The route is on Santa Cruz Avenue to Main Street. After the parade, we hosted an open house from 2 PM to 5 PM at our gallery (75 University Ave.) with Sake-nog. Learn more about Sake-nog.